JewishPost.com - Why Albania, A Nation of Muslims & Christians, Saved Every Jew. Why Albania, A Nation of Muslims & Christians, Saved Every Jew. 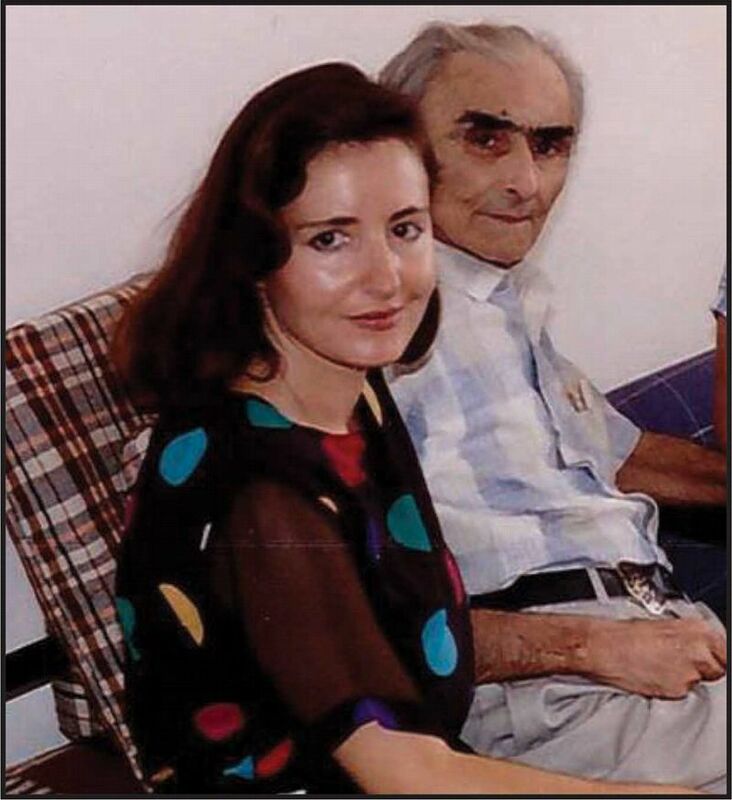 Felicita Jakoel and her father, Jozef, Jewish Albanians. Jozef , a Holocaust survivor, became the head of Albania's Jewish community. 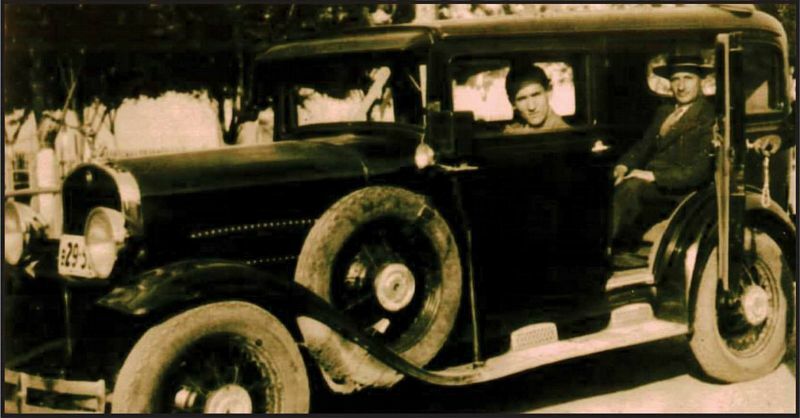 Arsllan Mustafa Rezniqi in the car Jews were transferred from his house and on to Albania. 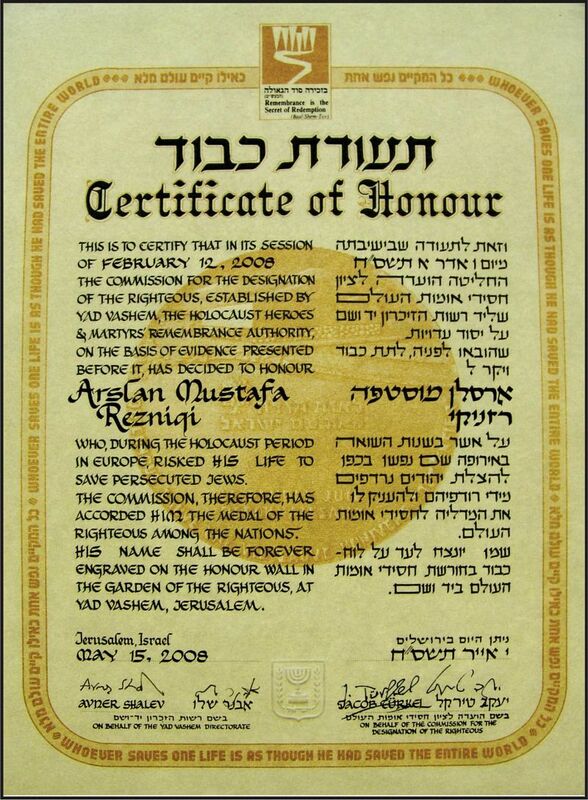 “Certificate of Honor” dedicated to Arsllan Mustafa Rezniqi from “Yad Vashem” Institute in Jerusalem, as a gratitude for his contribution on sheltering Jews during the Holocaust. 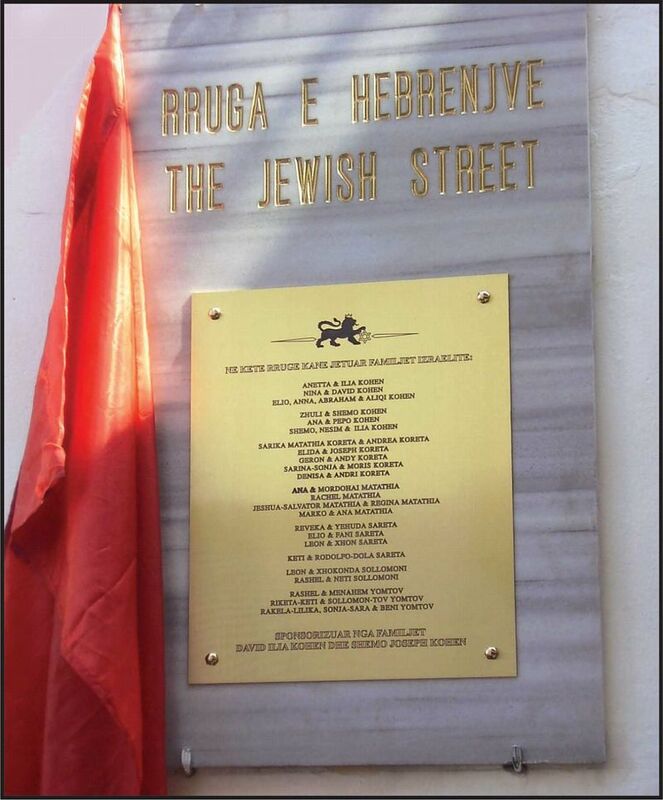 A street in Tirana, Albania, was renamed after the Jews in 2006. In 1990, the late Congressman Tom Lantos, a Holocaust survivor, and former Congressman Joe DioGuardi, were the first U.S.officials to enter Albania in fifty years. Albania’s last dictator, Ramiz Alia, handed them a thick file from the Communist archives of newspaper clippings about the Albanian rescue of Jews and undelivered letters and photos from Jewish survivors to their Albanian rescuers. This unprecedented story was hidden by brutal Communist rule for 45 years. When DioGuardi sent these documents through an Israeli friend to Yad Vashem, the Holocaust Martyrs’ and Heroes’ Remembrance Authority in Israel, they were authenticated. After recognizing 69 Albanians as Righteous among the Nations, the US Holocaust Memorial Museum in Washington, DC, publicly recognized the Albanian rescue in 1995. Yad Vashem did so in 2007, and in 2012, the Albanian rescue was memorialized by two Resolutions introduced by Senator Charles Schumer in the U.S. Senate and by Congressmen Dana Rohrabacher and Jerrold Nadler in the U.S. House of Representatives. The resolutions are part of the effort to bring the Albanian rescue of European Jewry to national and international attention. The Albanian rescue is unique because of its scale, including not just Jews within their borders but every Jew who sought refuge there during the Holocaust. Though the Nazis had invaded and occupied Albania and expected it to cooperate with Hitler’s “Final Solution,” everyone, from officials to farmers, organized to save Jews. There were approximately 200 Jews in Albania before the war. From the late 1930s, until Allied forces defeated the Nazis, thousands of Jews were smuggled into Albania by Albanians outside the state, primarily by Kosova’s Albanian majority. Once inside, Jews were treated by Albanians as guests that had to be defended, fed, hidden in private homes (often for years), and transported to safety whenever danger threatened. Why did Albania, a country consisting primarily of Muslims and Christians, rescue Jews? The answer lies in Albanian history. The oldest inhabitants of Southeast Europe, Albanians have survived centuries of invasion, occupation, expulsion, and even genocide. No sooner did they emerge from 435 years of Ottoman Turkish occupation, than they were divided by the “Great Powers” (Austria-Hungary, Britain, France, Germany, Italy, and Russia). Serbia annexed half of Albanian lands, including Kosova, and other parts were given to Montenegro and Greece. Only because of the intervention of U.S. President Woodrow Wilson was the State of Albania created after World War I. When World War II broke out, and Mussolini’s Italian fascists and then the Nazis invaded, Albanians treated Jews as guests, because religious and ethnic tolerance is part of Albanian history. It is based on the Kanun, a set of customary laws that has regulated Albanian conduct, since their Illyrian ancestors arrived in the Balkan Peninsula thousands of years ago. With its underlying moral code of besa, emphasizing tolerance and compassion, the Kanun was passed down orally and enabled Albanians to survive centuries of persecution. Besa links personal honor to respect for and equality with others. It also involves protection of a guest even to the point of forfeiting one’s own life. The modern Western concept of “foreigner” does not exist in the Kanun, only the concept of the guest. When the Nazis were bent on genocide, it was natural for Albanians to save Jews. Many of those who did risk their lives have left behind stories that dramatically illustrate the Albanian rescue. There is Ali Alia, a general store owner, who was visited by Nazi soldiers transporting Albanian prisoners to hard labor and one Jew to his death. After plying the soldiers with wine and convincing them that he should give food to the prisoners, Alia handed the Jew a melon in which he concealed a message telling him to flee to the woods and wait at a designated location. When the Nazis finally discovered that the Jew was missing, they pinned Alia against a wall. Four times, the Nazis put a gun to his head and threatened him with death. But he continued to deny what he had done, and when they finally left, he retrieved the Jew in the woods and hid him for two years. Besa, the driving force behind the Albanian opposition to genocide, today remains the underlying reality in the sovereign states of Albania and Kosova and among Albanians in Macedonia, Montenegro, southern Serbia, and northern Greece. Albanians, whether secular Muslims, Roman Catholics, Orthodox Christians, or Jews, have lived side by side in harmony for centuries, and often intermarry. While most of Europe turned its back on the extermination of European Jewry, Albanians demonstrated empathy, tolerance, self-sacrifice, and courage. These elements must be integrated at all levels of education around the world, so that differences of race, religion, and ethnicity no longer engender violence and death. Understanding the Albanian example can strengthen the resolve of peoples everywhere to end mass atrocity and to make genocide prevention one of the most important human rights issues of our time. In an effort to expand awareness of the Albanian response to the Holocaust and to apply it to the task of preventing genocide, the Albanian American Civic League and Foundation will hold an event in New York City on December 8. Descendants of Albanian American rescuers from Albania and Kosova, Jewish leaders, and genocide experts will join Members of Congress at the Museum of Jewish Heritage to reflect on the Albanian story of heroism. The purpose of the event is to send a message to the world about humanity’s highest expression of tolerance, self-sacrifice, altruism, and courage during one of its most horrific hours.